Your investment helps build & grow micro-businesses that generate livable incomes. Microfinance aims to create or grow profitable businesses that generate livable incomes. Microfinance institutions are community led and operated banks that provide banking facilities to marginalized communities. These community banks provide savings products help grow the wealth of the community and provide commercial financing to help micro-entrepreneurs grow their revenues and incomes. Your investment helps community banks extend financing to create and grow more micro-businesses. Your investment is pooled into a fund with multiple investors and disbursed across dozens of community banks and thousands of individual entrepreneurs. This way, money can be used where its needed most urgently, and your risk is diversified across a broad portfollio. Not all microfinance is created equal. Financing via Blossom's platform is used strictly to finance income-generating businesses—never for consumer spending. The aim of each investment is to increase a family's overall household income—and to put the loan sharks out of business. but brings online efficiency using the Ethereum blockchain. SmartSukuk cannot include usurious loans, margin trading, or excessive speculation. All businesses and projects must meet strict criteria including screening that prohibits any activities that could cause harm to society. Using Blossom's platform, investors get access to unique and interesting projects in emerging markets. Projects are evaluated and underwritten not only on financial merit, but on the underlying impact to local communities. Every investment includes a legally enforceable contract and corresponding legal operating structure to protect investors. No up-front administrative or service fees charged to investors. Blossom earns a share of investor profits. Blossom's Investor Portal is designed with international investors in mind. Invest using cryptocurrency or via conventional bank transfer. Investments are end-to-end shariah compliant using fully approved shariah structures such as profit-sharing (mudarabah). Portfolio of cooperative microfinance institutions. Incredibly better banking. Made by incredible locals. See why communities LOVE their local BMT. The “BMT” model combines a for-profit motive (“Baitul Tamwil”) with a social-benefit motive (“Baitul Maal”). BMTs provide core banking facilities to marginalized communities where traditional banks don't operate or charge fees beyond what the community can afford. BMTs drive wealth creation within local communities via savings programs and microfinance, and then use their commercial returns to fund social enterprise projects that solve local problems while providing sustainable income to the poor. 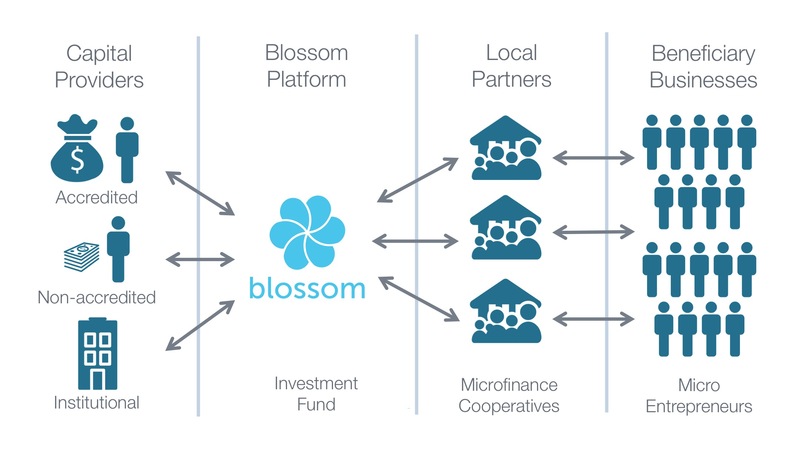 Unlike peer-to-peer platforms which carry risk of indivudal default, Blossom uses a fund model. Your investment risk is diversified across a portfollio of BMT community banks which in turn invest into thousands of micro-entrepreneurs across various regions in Indonesia. Our local partner - PBMT Ventura - maintains one of the highest quality and largest Islamic microfinance networks in existence with nearly two decades of operating experience. We're passionate about helping great investors and great institutions succeed and prosper together. We have more than two decades of financial services technology and software services industry experience. We're not the only ones excited about helping micro-entrepeneurs. Read what the press is saying around the world. Investing in microfinance institutions (MFIs) has become increasingly popular in the last decade. This option, often included under impact investing, allows investors to earn returns while providing small merchants with financial assistance. Blossom's concept can be said to be breaking ground: it operates on Bitcoin and targets the global Muslim community. If there is no profit, Blossom takes no fee. This allows both Blossom and the investor to benefit without violating the sharia prohibition against taking or paying interest. In largely Muslim Indonesia, a country of more than 13,000 islands where some 50-60% of adults do not have bank accounts, Islamic microfinance is starting to fill the gap. The company collects capital from investors all around the world and forwards the funds to microfinance institutions for investments. After an annual cycle the company distributes profits back to investors. Blossom Finance uses Bitcoin to help Muslim entrepreneurs and small businesses by offering microfinance services. Blossom Finance collects capital from investors all over the world and provides the funds to microfinance institutions for investments by using cost-saving Bitcoin transactions. After an annual cycle, the company distributes profits back to investors. on topics relvant to ethical investment & Islamic finance. Blossom awarded "Most Outstanding Islamic Micro Credit Company" for its SmartSukuk™ platform funding microfinance institutions in Indonesia. Speech at 5th Annual Shariah Economic Festival in Surabaya highlights benefits of technology for a strong economy.